Now how many times did we as kids walk through this gate? 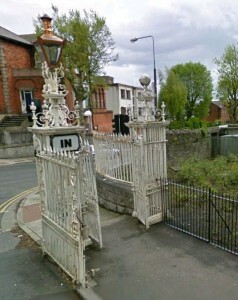 It’s what’s known as the North Circular Road gate. There was always a house on Glenbie Road that had an apple tree in the back garden. You could walk up the lane that led to the side of the railway line and around the back of the houses. If you stood up on the railway wall and walked along you could see into all the back gardens and spot an apple tree. Then we’d count the number of houses down from the lane. What we did next was to go back around onto the road and one of us would walk along counting and when we got to the appropriate house we’d knock on the door and ask for a cup of water to drink. If there was no answer we were made, you had to gallop back up the lane and tell the gang the coast was clear and we’d climb up over the wall like soldier ants. If someone answered the hall door however the robbery was shelved for another day. When you landed in the garden the first thing you did was to shove the front of your jumper down your trousers. Then you grabbed up any apples on the ground and shoved them down your jumper. Other lads would jump up and try to knock the apples off the tree with a big stick. Now all of this had to be done at the speed of light because if by chance someone suddenly appeared at a window or door we’d be shopped. So it was in and out as quickly as possible, Mission Impossible…and then back over the wall and gallop at full speed down onto the North Circular Road and into the Park. There was a tunnel that went under the road here and allowed the trains to go under the Park. We were very brave one time and decided to walk all the way through the tunnel. Now we didn’t have a torch or bicycle lamp with us or anything like that and it was pitch black inside. We were all walking along like the Magnificent Seven until someone roared ‘There’s a rat’… well I can tell you that’s all that we needed. We galloped and galloped like the hounds of Hell were after us and didn’t stop until we got inside this gate and safety. We were all shaking with fright and one of the lads was saying that the rat was as big as a dog, now no one actually saw a rat, they said later that they thought they saw a rat. It didn’t really matter because then we could all brag about how we weren’t afraid of rats or the dark, sure weren’t we from Cabra?